The Knit Editor software aims to be installable and usable by end-users. In the whole summer of code, we focused on development and code documentation from the perspective of a developer. In this blog post we will discuss how the Knit Editor is presented to the end user. So, you reading this blog: Please comment with your thoughts on the sketches. Currently, a site is in the making that shall present the Knit Editor software as is state of the art. The inspiration came from the talk by Tracy Osborn at PyCon 2016: “Web Design for Non Designers”. The site is currently in the making at fossasia.github.io/kniteditor. If you click on the following images, you get redirected to the implementation of the concept. First thing that comes into view is the download button. This leads to the download site. Then, wen can see three popular use-cases of the knit editor. At the bottom, new developers can see that they can contribute. End users are knitters of all ages. As tested with my mom, they expect the language to be at the top-right of the page. Both, the download and the start developing button are highlighted in a different color to make certain that they are an action the user is expected to perform. When you access the site you get automatically redirected to your browsers configured language. When you click the download button on the main page, you reach the download site. Depending on the operating system information the browser sends, your download starts automatically, below, this is sketched for Windows. Next to the download page, you may want to find other versions of the software or not. This is to be evaluated. Maybe a slightly less visible button is right for that or it can be left out. Usually, no-one uses the old software. At the bottom, you can see that there is a predecessor of the software which is called “AYAB-Apparat”. Some people may expect to find this software, too. If you clicked “Start Developing” on the main page, you will be confronted with the site for development. There are two ways main flavors of contributing. Either you translate or you write program code. Therefore, we have two buttons that skip to the corresponding sections. At the bottom, you can see that there are tutorials on how to set up the environment for development. Videos for this can be found under this Youtube playlist. At the end of GSoC we should document the code. Since we did documentation-driven development, there was already a focus on the developers from the start. End-user involvement fell short during the development phase. “Documentation is the way of informing people.” – this is something I learned from a talk. Thus, I create the new site for the knit editor as a documentation about the project fit for non-developers. In the Google Summer of Code effort on knitting machines with AYAB, we created the AYABInterface module. This module allows us to control machines like the Brother KH-910. Click here to see it in action. Talk about uncertainty in the issue. Of cause these steps were mixed but the objective is clear to first specify and then let the implementation follow. From my perspective this made sure that other people can implement this protocol, too. After all, it should be specific enough now, to write source code for it. The underlying Communication relies on a byte stream to communicate. This abstracts from the serial protocol and enables us to plug in e.g. sockets if someone wants to communicate via WIFI or LAN. If you click it, you are redirected to an interactive documentation web page where you can click the different states and messages to view their implementation. an implementation that follows the specification and as such is exchangeable and a reference for other library developers. Once, your pattern is done, you go over to the knit settings. Currently, there is only one ability to knit, knitting with the AYAB hack. You can choose your machine type and the connection and start knitting. After you started knitting, you see the pattern which you want to knit. Right next to the pattern, you can see the instructions for you. You can follow these to create the knit peace. At the current state, all this is rather sketchy. The basics work. For the best user experience, there is still a lot to do. I started a conversation on strickforum.de and was inspired to take a closer look at DesignaKnit 8. A free Demo version of DesignaKnit is available which cannot save changes to patterns or shapes and cannot connect to a knitting machine. Otherwise all functionality is available. Patterns can be applied to shapes. I did not look very closely at the editors because I do not know much about pattern generation, especially shape or sewing patterns. And the editor for the color patterns did not work for me. I took a look at some of the features available in the interactive knitting. There are some interesting features we would also like to implement. I was not able to take in all the functions available. I could not connect it to a machine and I am still a beginner with knitting machines, which is why I am probably missing some features which make life easier. 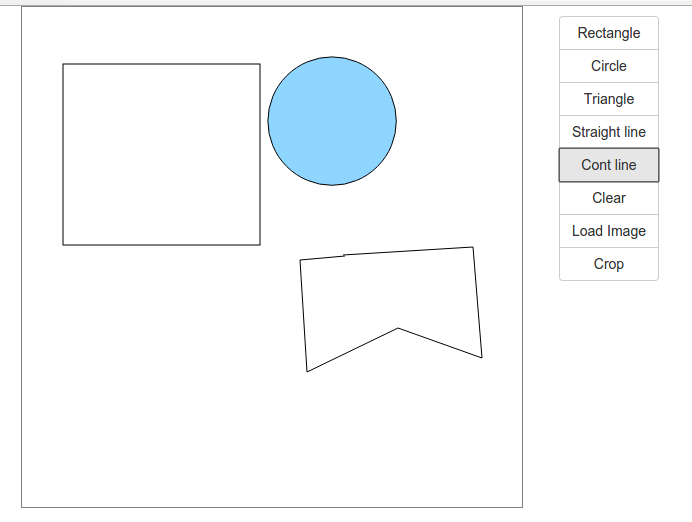 DesignaKnit can be configured to play sounds when an action, like decreasing the number of meshes, needs to be taken. Voice cuing is also possible. Furthermore, the view for the instructions for the human can flash yellow and displays what step needs to be completed by the human next. In the image above the number of meshes should be decreased by 6 on the right side. The idea of extra audio and visual cuing is very interesting and we are considering also having this option in our interface. We are not yet sure how we will organize all the information, but the information we will show to the user will be similar to what is shown in DesignaKnit. The interface for DesignaKnit serves its purpose well. However, we think we can create something that is a little more appealing to the eye. To keep our Design of the user interface clean and simple we are designing for mobile devices first. In our Google Summer of Code project a part of our work is to bring knitting to the digital age. We is Kirstin Heidler and Nicco Kunzmann. Our knittingpattern library aims at being the exchange and conversion format between different types of knit work representations: hand knitting instructions, machine commands for different machines and SVG schemata. 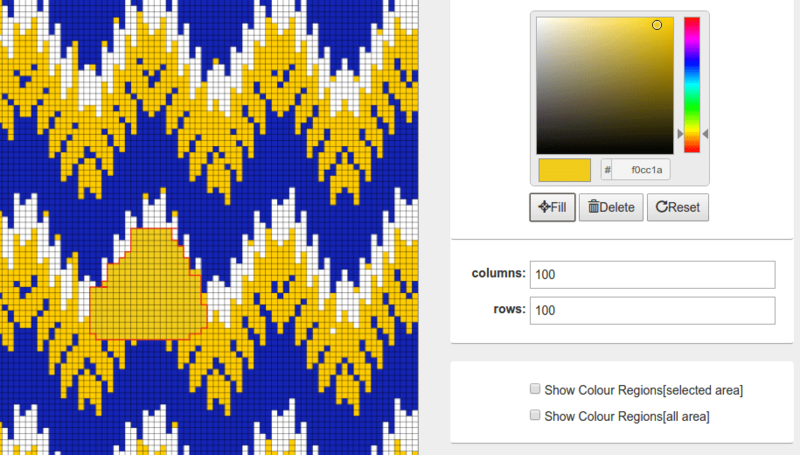 The generated schema from the knittingpattern library. The original pattern schema Cafe. Increase the version in the knitting pattern library and create a new pull request for it. Merge the pull request after the tests passed. Travis then builds the new tag and uploads it to Pypi. With this we have a basic quality assurance. Pull-requests need to run all tests before they can be merge. Travis can be configured to automatically reject a request with errors. As mentioned in a blog post, documentation-driven development was something worth to check out. In our case that means writing the documentation first, then the tests and then the code. Writing the documentation first means thinking in the space of the mental model you have for the code. It defines the interfaces you would be happy to use. A lot of edge cases can be thought of at this point. When writing the tests, they are often split up and do not represent the flow of thought any more that you had when thinking about your wishes. Tests can be seen as the glue between the code and the documentation. As it is with writing code to pass the tests, in the conversation between the tests and the documentation I find out some things I have forgotten. When writing the code in a test-driven way, another conversation starts. I call implementing the tests conversation because the tests talk to the code that it should be different and the code tells the tests their inconsistencies like misspellings and bloated interfaces. With writing documentation first, we have the chance to have two conversations about our code, in spoken language and in code. I like it when the code hears my wishes, so I prefer to talk a bit more. Everything that is public is documented. The documentation is syntactically correct. For every module there exists a .rst file which automatically documents the module with autodoc. A Sphinx build outputs a list of objects that should be covered by documentation but are not. Sphinx outputs warnings throughout the build. testing out documentation allows us to have it in higher quality. Many more tests could be imagined, but the basic ones already help. It is possible to test your code coverage and see how well we do using Codeclimate.com. It gives us the files we need to work on when we want to improve the quality of the package. Landscape is also free for open source projects. It can give hints about where to improve next. Also it is possible to fail pull requests if the quality decreases. It shows code duplication and can run pylint. Currently, most of the style problems arise from undocumented tests. When starting with the more strict quality assurance, the question arose if that would only slow us down. Now, we have learned to write properly styled pep8 code and begin to automatically do what pylint demands. High test-coverage allows us to change the underlying functionality without changing the interface and without fear we may break something irrecoverably. I feel like having a burden taken from me with all those free tools for open-source software that spare my time to set quality assurance up. In the future we like to also create a user interface. It is hard, sometimes, to test these. So, we plan not to put it into the package but build it on the package. Our goal is to create a knit-work exchange format. This includes the conversion to a scematic view of the knittting pattern as svg – to make it endlessly scalable and allow conversions to png, pdf and paper. This week we ended the prototype of the SVG conversion. The positions are a bit off and instructions are placed above eachother. Most of the work is done. We are also able to load and save knitting patterns a png files. We loaded them (1), converted them to a knitting pattern and then saved them again as png (2). This way we path our way towards using the ayab software and actually knitting the pattern. Also we can convert the knitting pattern to an svg consisting all of knit instructions (3). Here is the code for it in version 0.0.8. We are currently working on a format that allows to exchange instructions for knitting independent of how it is going to be knit: by a machine like Brother, Pfaff, or by hand. For this to be possible we need the format to be as general as possible and have no ties to a specific form of knitting. At some point the transition to a format specifically designed for a certain machine is necessary. However, we believe that it is possible to have a format so general that instructions for all types of machines and for hand knitting could be generated from it. We have decided to use JSON as the language to describe the format, because it is machine readable and human readable at the same time. The structure of our format follows the rows in knitting. Our first thought was about creating a format that would describe how meshes are connected and how the thread travels. This would allow for great flexibility and it should be possible to represent everything like this. However, we have decided against it, because we think this format would be quite complicated (different orientations and twists of meshes possible, different threads for multiple colors…) and would get quite big very quickly, because of all the different properties for each mesh and because of all the meshes. Furthermore, and this point is probably more important, knitters do not think this way. If we had a format like that, it would not be easy to understand what was happening for human beings. Whenever I knit by hand, I never think about how all the meshes are connected by this single thread I am using. I always think about which operations I am performing when knitting in each row. Instructions for creating patterns in knitting are also written this way. They give the knitter a set of knitting instructions to do and possibly repeat. We have concluded, that most knitters think in knitting operations performed rather than connections between meshes. Knitting instructions from Garnstudio’s Café. Therefore we have decided to base our format on knitting instructions/operations. The most common instructions probably are: knit, purl, cast on, bind off, knit two together, yarn over. Of course for increases and decreases there are many different operations which work in a similar way but have slight differences (e.g. skp, k2tog). Since in knitting many things are possible and it is unlikely that we ever manage to create a complete list of all the possible operations you can perform in knitting we have decided to have a very open format, that allows the definition of new instructions. "en-en" : "Knit 2 Together"
"en-en" : "Knit two stitches together, as if they were one stitch." Knitting patterns consist of multiple rows, which consist of multiple instructions. Furthermore we want to define the connections between rows. This is important, so we can express gaps or slits which are multiple rows long. For example when knitting pants the two legs will be separate. They will be knit separately and their combined width will be increased in comparison to the width of the hip. Here is an example for a pattern which specifies a cast on in the first row, then a row where all stitches are knit, then the last row is bound off. Connections are defined “from” one row “to” another. The ids identify the rows. The optional attribute start defines the mesh where the connection starts. If start is not defined, the first mesh of the row is assumed. When indexing the list of meshes in a row the first index is 1. The optional attribute “meshes” describes how many meshes will be connected, starting from the mesh defined in “start”. The Python object structure for working with the parsed knitting pattern. Each row has a list of instructions. Each instruction produces a number of meshes and consumes a number of meshes. These meshes are also the meshes that are consumed/produced by the rows. Our idea is to create a knitting library for a format that allows conversion of knitting projects, patterns and tutorials. Usually, communities will only focus on the knitting format for their machines. Our approach should be different and be able to support any knitting communities efforts. We connect to different communities to get a broader view on what their needs are. Our knitting format is based on knitting instructions like knit, purl, yarn over, skp. We found a comprehensive list on Wikipedia. From time to time we meet with other people who also knit and could use our software. First, we met with Viktoria from ETIB Berlin. She taught us a lot about knitting, how she does it, that almost everything could be created from one peace with the machine. Also, that AYAB is used for lace patterns. We saw examples where she let meshes fall so that larger holes were created. Our goal is to support laces in the file format. Color patterns should be possible across sewing edges. We are also in touch with Valentina Project. With their software we would be able to connect to yet another community and use their sewing patterns for custom-fit clothes. We got in touch with Kniterate. They and we share a lot of goals. Because they create a startup, they are very cautious what they release. They focus on their open-source knitting machine first and later on the software. They already created an editor much like we imagined ours to be, but as a web application. A way of collaboration could be that we understand their file format and see how we can support it. Only talking about our GSoC project is worth it as other people may have seen alike at Maker Faires and other hacky places. We have the chance to bring communities and efforts together. A knitting format for exchange is never complete. A knitting format for machines must be complete. In contrast to a knitting format for a automatic machine, it is possible, to have machines operate in semi-automatic modes or just to knit by hand. In both cases, meshes could be changed in a way that was never foreseen. This is why we did not base it on meshes and mesh types but rather on instructions – closer to the mental model of the knitters who perform instructions with their hand. Some of the instructions are understood by the machines, some could be adapted a bit so the machine can do it automatically or faster and some are still necessary to be done by hand. We created a Python module for that, “knittingpattern“. We work on it in a test-driven way. Hi, we are Kirstin and Nicco and for the next couple of months we will be working on the AYAB project. AYAB is an abbreviation for All Yarns Are Beautiful and the project works on the Software that interfaces with the knitting machine and directs in in what to knit. Zou can read more about the existing software in the recent blogposts. We want to implement two new features and expand on the functionality of the software that replaces the original firmware of the knitting machine. We want to work on an exchangeable format that stores all information necessary for knitting e.g. a sweatshirt. It should contain the sewing pattern, the color pattern(s) defined for the different parts of the knit piece and the stitch pattern, also defined for the different parts of the knit piece. This new information that we will have through the format will allow us to create directions for the user in case the machine cannot switch yarn colors on its own or add or remove stitches, but the user can. We want the software to have on screen instructions for the user, telling the user what to do before they knit the next row. This will make knitting with more than two yarn colors possible and make it easier for users to knit shapes where they need to add and remove stitches. This is very much needed when knitting clothes. Our next steps are to make user studies to find out about how people use the knitting machines, what is necessary and important. If you like to lend us a hand, please contact us. Also we are doing weekly hangouts in the evening, Tuesday 21:00 (Berlin, GMT+2). In this blog post I will show what are the functionalities implemented in KnitWeb application. First of all let us look into why there is a web application to get a knitting job done. It’s simple. Going for a web application is the best way to acheive platform independence among all the knit app firmware. So the if the hardware level functionality can be abstracted out to a separate library then the web application can use that and provide a common interface to all different knitting application platforms. This is what we have been doing in this GSoC, to provide a common platform and interface for all open source knit app solutions. So let’s look at the KnitWeb Functionality. KnitWeb consists of two major components, KnitWeb front end and KnitWeb back end logic. 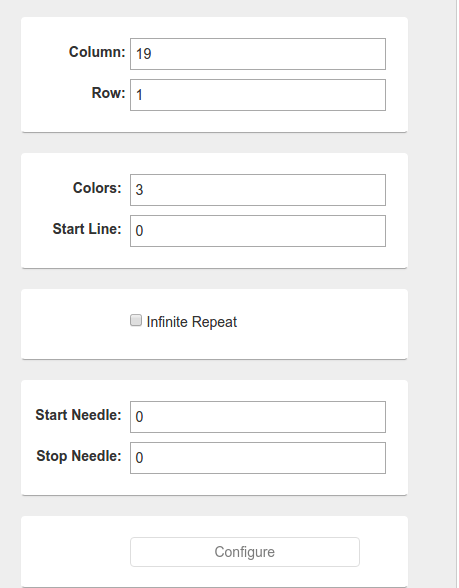 KnitWeb front end consists of a pattern editor for edit loaded patterns to workspace, Simulator for show knitting progress and a drawing tool for draw a pattern from scratch. 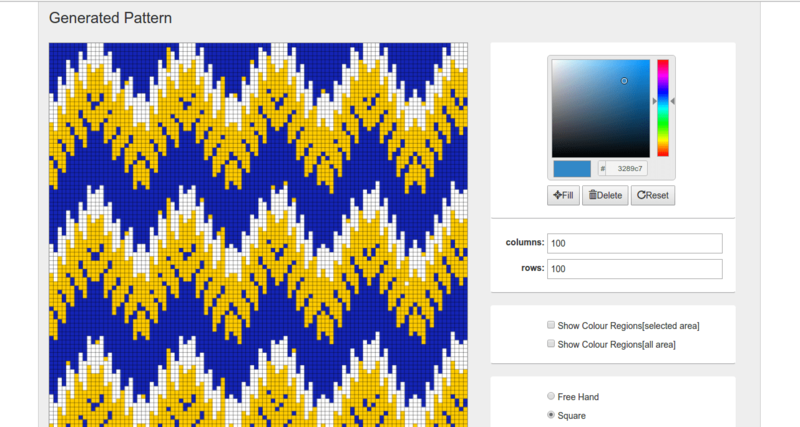 Therefore Pattern editor component is used for easily edit the pattern before send for knitting. Knitting Simulator is used for render knitting progress to the user with a enhanced user experience. It also consists of main controls for knitting job which user can start/pause/stop a job while knitting. 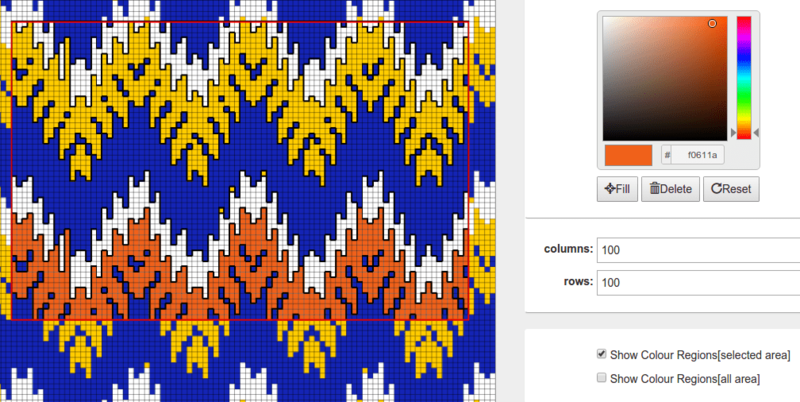 KnitWeb Drawing tool is used to generate a pattern from a scratch. It provides basic drawing tools including pencil, line, basic shapes and color palette. It also used for replicate a pattern from a existing pattern or a image. Then user can export it to the workspace to continue knitting job. Loads the pattern according to number of rows and columns(stitches) to the editor. Pattern is pixelated as the defined number of rows and columns. Select pattern area using square/free hand tools. Then edit colour values of selected area. Show colour regions of selected area/whole pattern and easily edit their colour values. Configure machine type and Available ports before creating a knit job. In this step knit web client is communicating with the knit lib server to get those information. After that user can click proceed knitting button to create a knit job. 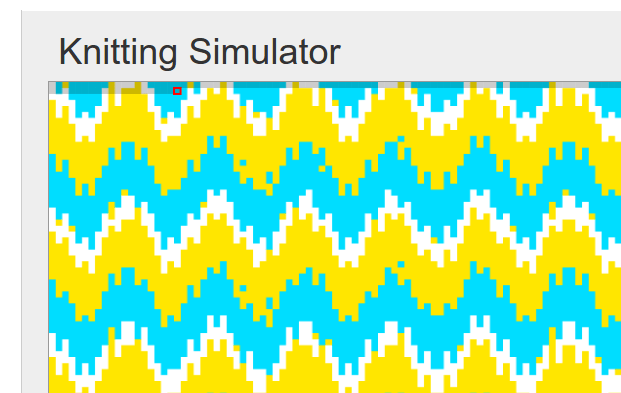 Knitting simulator provides knitting progress to the user with enhanced user experience. Current knitting progress is shown to the user as above and also with a progress bar. Knitting simulator window consists of other meta data input needed for configure knitting pattern(knitpat) file such as Start Line, Start Needle, Stop Needle, Number of colours used etc. Drawing tool is used to generate a pattern from scratch or design patterns by replicating image or a texture. After editing finished pattern can be exported to the workspace. This sums up the most critical functionalities of knitweb application. I would like to continuously contribute to FashionTec as this inspired me to research and do things that I have not done before. :).